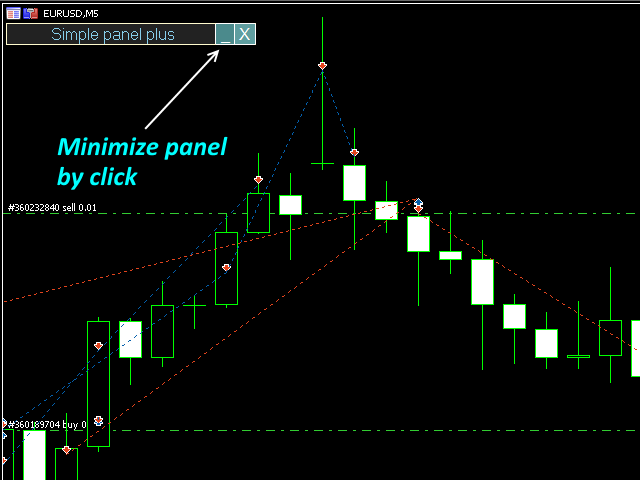 This is a simple panel EA for one-click trading. Panel can open market orders, calculate lotsize and etc. Trade from the CHART and trade from the KEYBOARD! You will able to open all types of pending order, and grids of pending orders and delete them. Also, you can chose one of several types of closing orders. For example, close only buy orders,only sell orders, only profitable or loss orders. 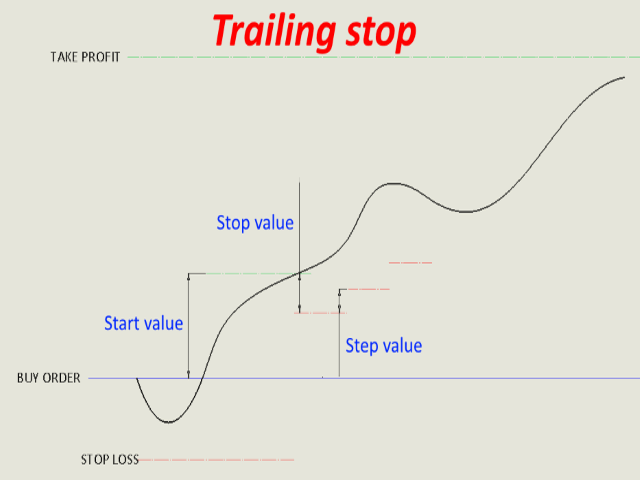 You can also enable two types of trailing stops and breakeven, basket profit and loss,partial close with saving step of close to file. It's better than save step to memory, because you will not loss step of close after restart Metatrader 4 or your PC. The EA distinguishes its orders from others, therefore, the magic number must be specified in the panel settings. You will able to manage all orders by symbol or only selected magic numbers. The EA save settings of Stoploss, Takeprofit, Lotsize and etc. after you close one. You needn't to input them every time. The panel is able to take screenshots when opening and closing deals to allow further analysis of the signals for opening/closing orders. Stop loss and take profit are set in pips! Do not forget to enable auto trading! To move panel on the chart, you should double click in the left upper corner of panel. Addition magic numbers -addition magic numbers, please use ',' separator. For example : 111,222,5356 and etc. 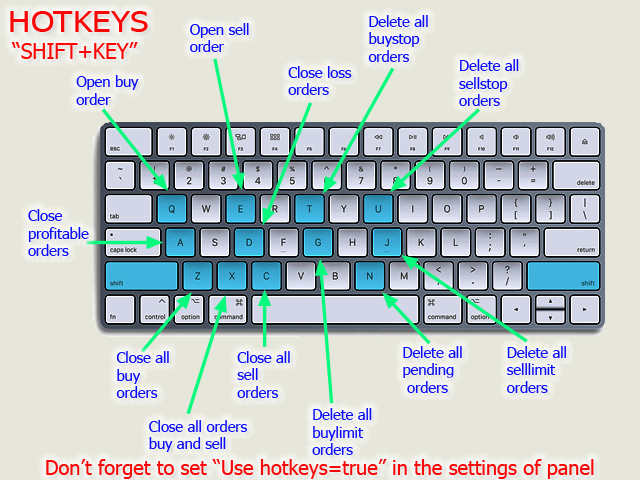 Use hotkeys - Allow to use hotkeys, please see picture. Please be sure what chat window is active else hotkeys will no work! Warning! 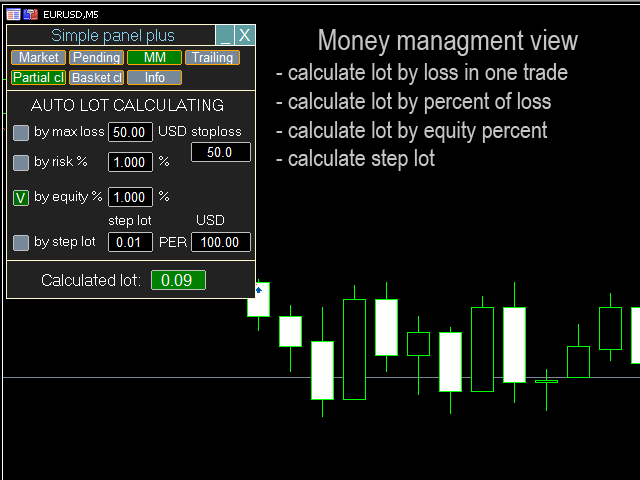 EA not work in strategy tester because Metatrader may not allow to use buttons, you can see video to know how to panel work. So very great Panel EA. Made panel work on different resolutions of screen. Fixed some issue with lot size calculating. Fixed deleting of graphic objects while timeframe switch. Made panel movable. Just click left upper corner two times and move in right place. Полностью переработан дизайн и функции панели. Added highlighting of the buttons for closing orders when there are open orders. 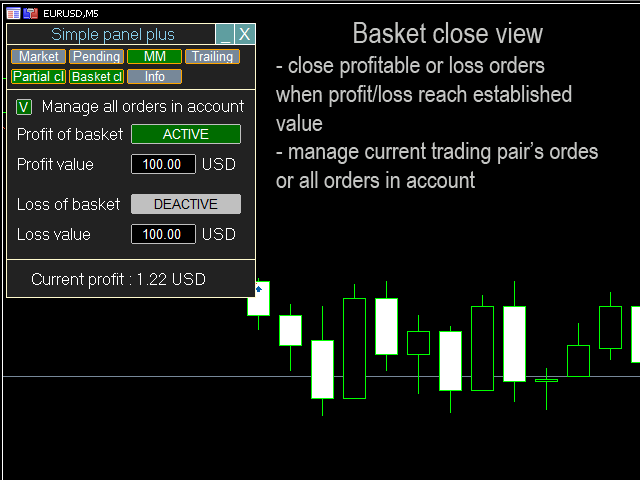 Added calculation of profit in pips.